Today I started out at the Borax Museum. 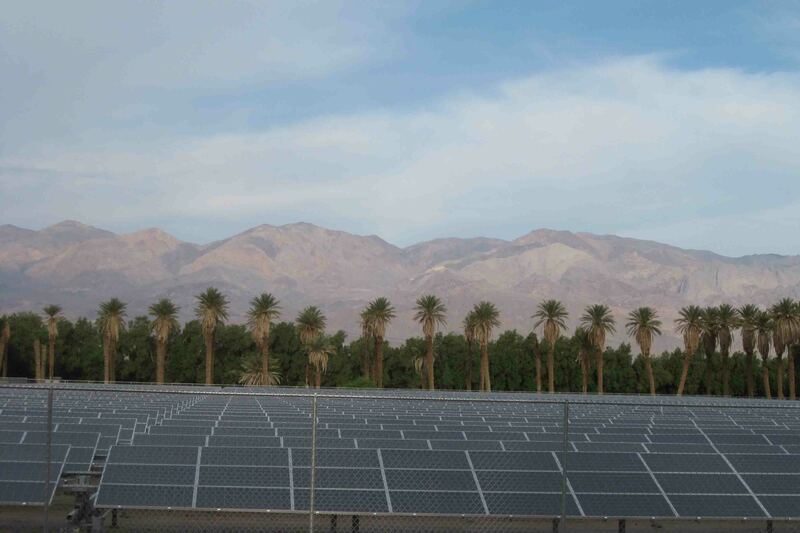 It is located next to the Furnace Creek Ranch which includes a motel, restaurant, bar, gift shop with a grocery, tennis courts, a golf course, and a short trail through palm trees to a solar power viewing station. 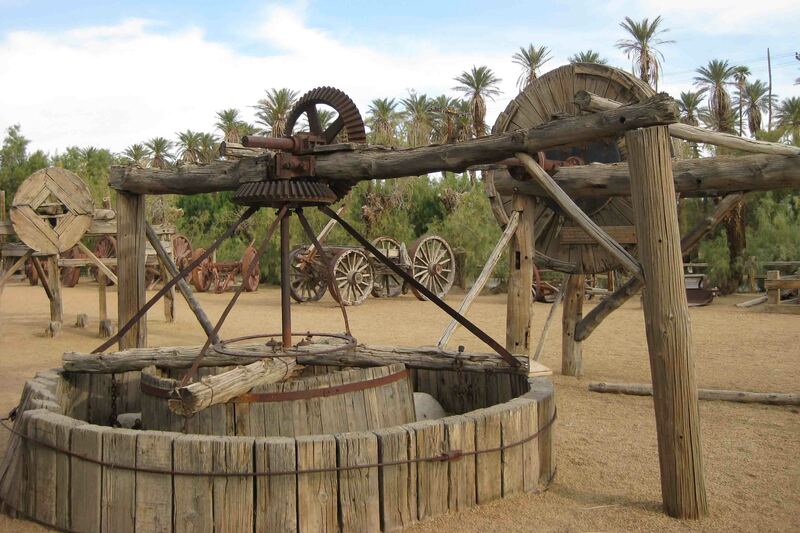 The museum displays original mining machinery and also has a sign indicating the location is 178 feet below sea level. This happens to be a virtual cache too. In fact, several of the stops I mentioned yesterday were either virtual caches or earth caches though some I may not have collected all the information in order to claim…BUMMER. After a quick stroll through the outdoor museum, I took Petey for a walk through the palm trees. I couldn’t figure out the exact purpose for all the palm trees. I would have said shade, but they were specifically planted in one area like they were meant to block the unsightly square of solar panels behind them, yet a sign and a path made the solar panels another “attraction”. Perhaps the resort was simply harvesting their dates. Regardless, Petey and I enjoyed the path through the palms more than the perimeter of the campground. Another day in the park marked another day of a lot of driving. Death Valley is enormous. Today we visited Scotty’s Castle, Ubehebe Crater, Old Stovepipe Wells, Mosaic Canyon, and Darwin Falls before camping on the Western edge of the Park in the Panamint Springs and Dunes area. 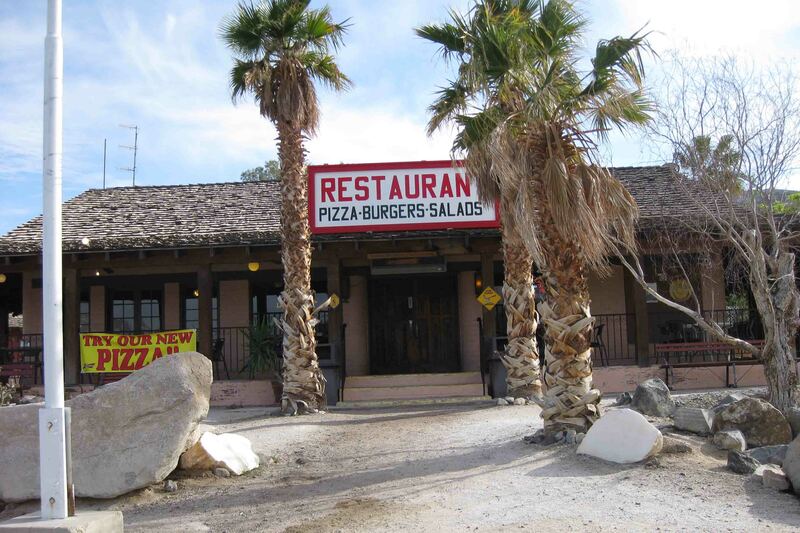 We passed by desert to the west and mountains to the east as we drove nearly forty miles to Scotty’s Castle. 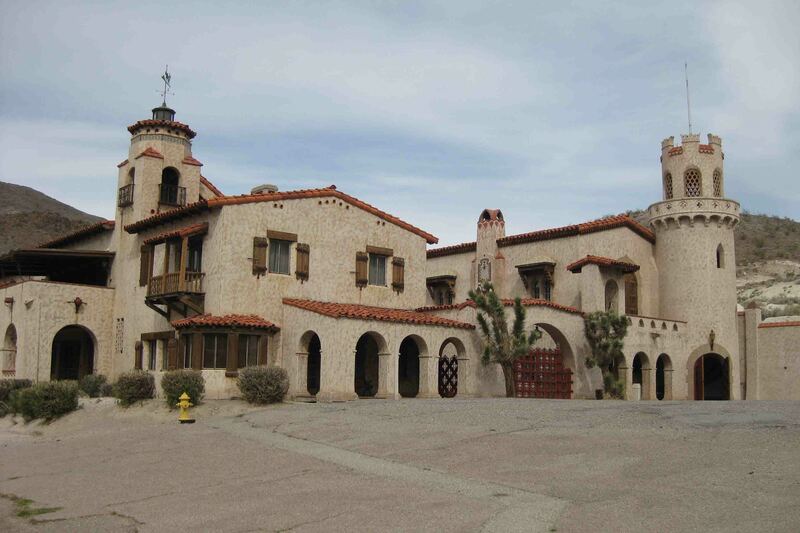 The Spanish mansion was built in 1922 by Chicago businessman Albert Johnson whose doctors advised him to spend time a warm, dry climate. 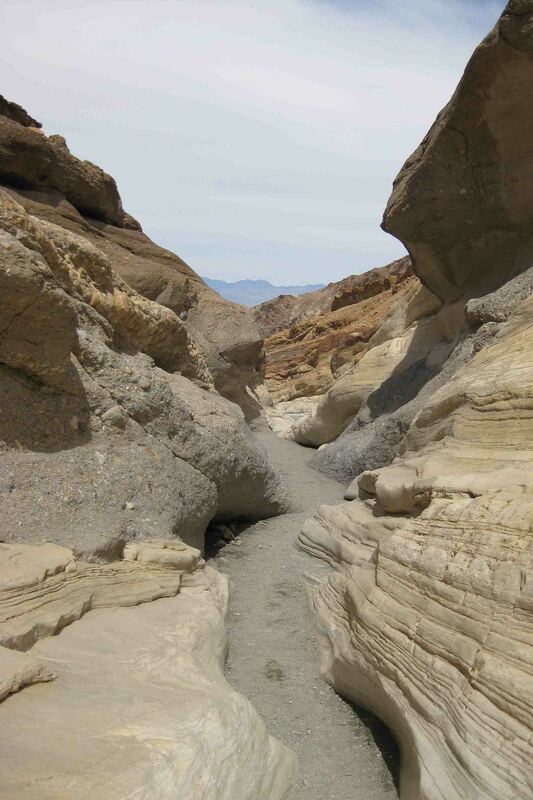 It takes its name from Johnson’s friend, Walter Scott, also known as Death Valley’s Scotty. Scotty helped Johnson conceive the project and lived there after his death. I believe the park service offers three different guided tours of the castle. I wasn’t sold on spending the morning inside or underground while the weather was so pleasant, so I simply enjoyed the outside view. I think I will have to come back as the tour of the house with a giant pipe organ and an indoor waterfall as well as the tour of the underground tunnels both sounded interesting. 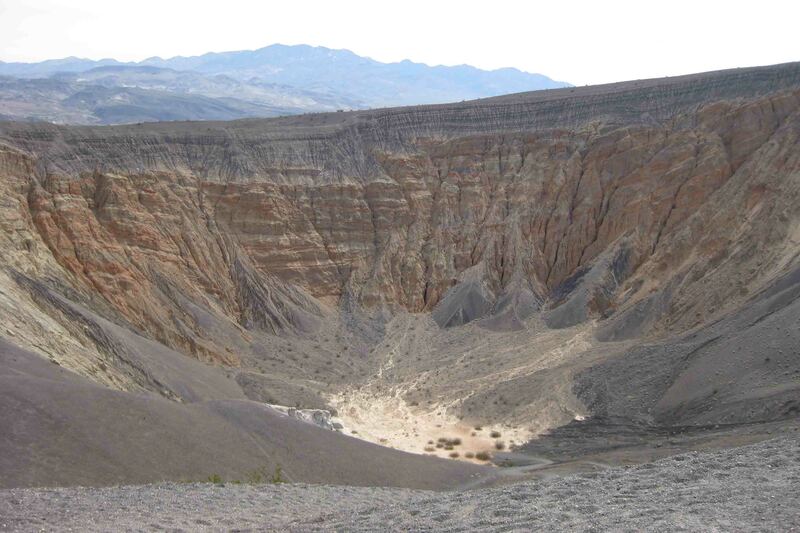 Six miles to the west of Scott’s Castle stood the sunken Ubehebe Crater. As opposed to most craters which date millions of years old, this one dates approximately 2,000 years old. The explosion that formed the crater shattered rock over a six-square mile area. The crater is half a mile across and 500 feet deep. Upon our return toward the center of the park, we stopped at the Old Stove Pipe Well. 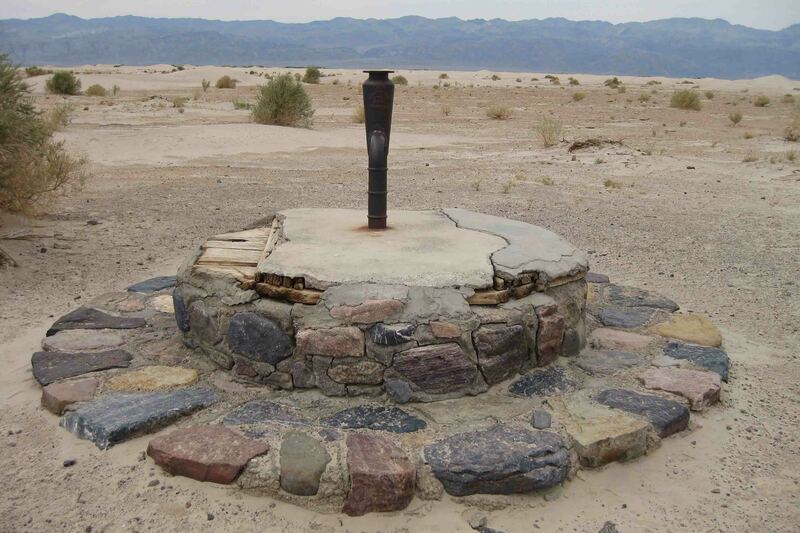 The well was situated at the junction of two old Indian trails and was the only known water source in the dune area. When sand obscured the spot, an old stovepipe was inserted as a marker, thus the name. After visiting the well, we turned west to find Mosaic Canyon. While Petey waited for me in VANilla, I took a 45 minute walk up the canyon. Parts of the canyon were so narrow it required climbing over the slick marble walls. In contrast to the marble, other portions of the canyon walls consisted of rock fragments cemented together resembling mosaics. While wandering beneath the overcast sky, I just couldn’t help but think how many unique areas are located in this one park. Who would expect to see so many different geological forms in a sixty mile radius? VANilla continued west, though it might be more appropriate to call her latte or cocoa now. She is a light brownish tinge thanks to all the desert dust we’ve been traveling through for the last week. She took her last bumpy ride of the day down a rocky 2.4 mile road to the start of a hike to Darwin Falls. 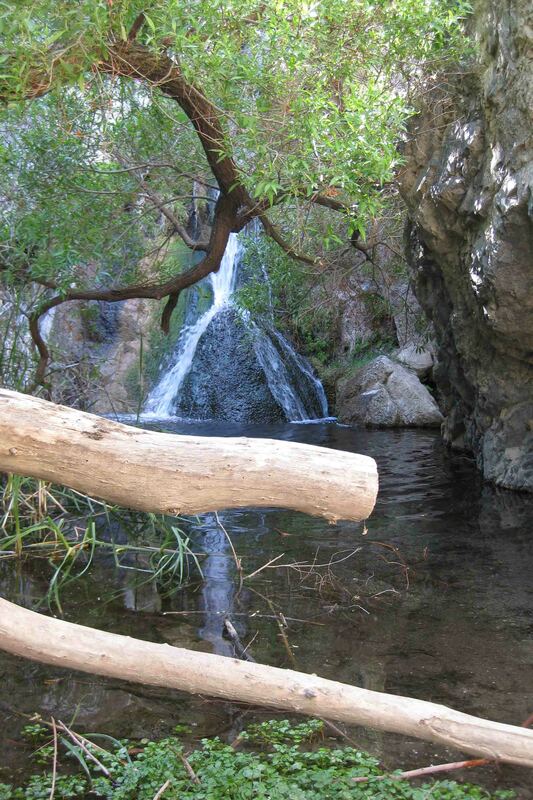 Yes, a waterfall in the desert. While this was my last adventure in Death Valley, it was the first for two Englishmen and for a couple that lived in Los Angeles. “Just wait”, I said, “the rest of the landscape is so different from this”. The hike required some creek crossings over logs and some billy goat balancing on a few rocks to reach the small yet picturesque waterfall. It was getting late in the day and the clouds were dispersing, so I didn’t stay long by the tree covered creek, but headed back to give Petey a little attention. In fact, he got to join me for dinner on the patio at the restaurant across from the campgrounds. 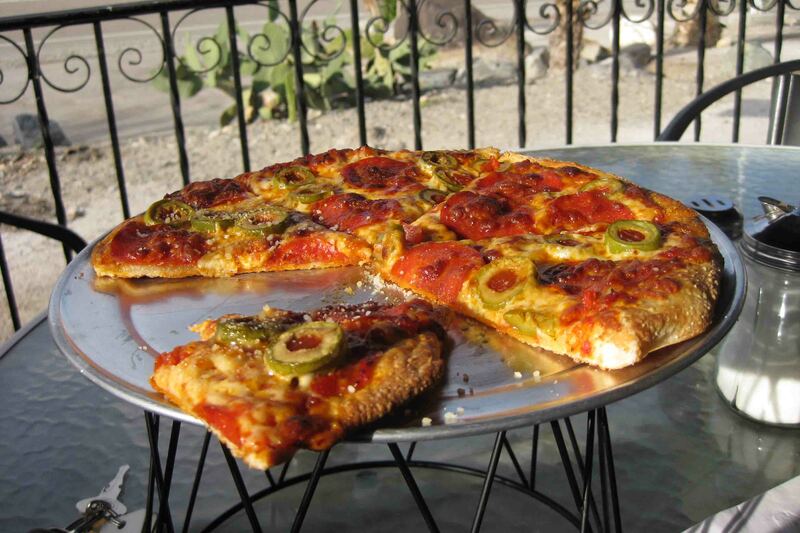 I had a pepperoni and olive pizza that while ridiculously overpriced, hit the spot. Back at the campgrounds, I met a few of my neighbors. 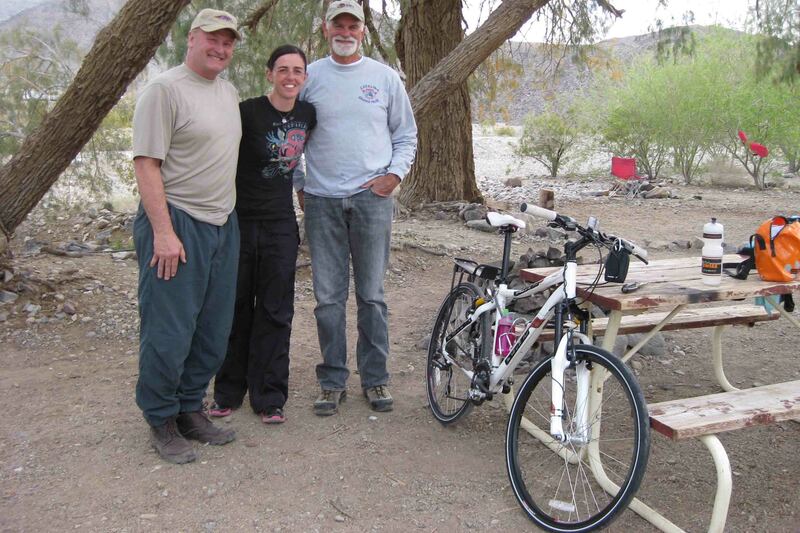 Randy and Terry were taking advantage of the dirt roads with their dirt bikes. They travel around to different places to take their bikes for a spin. I also met Flo who was from France, although she has been living in Montreal for the past few years. She recently quit her unemployment counseling job, went to Alberta to improve her English, and is now spending a month and a half riding her bicycle through California to raise money for cancer. 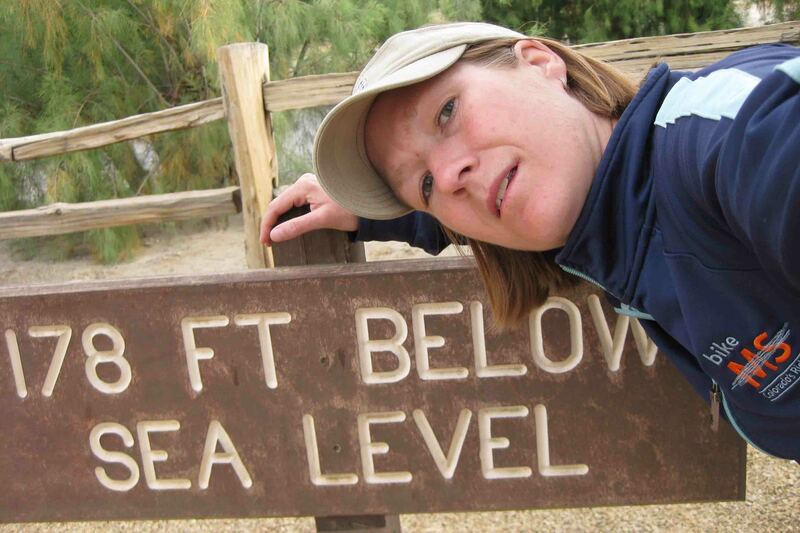 Kudos go out to her as her ride through Death Valley will require her to climb from below sea level to 5,000 feet on more than one occasion! In addition, miles of the roads are a 9% grade. I had trouble driving VANilla around them…I can’t imagine cycling them! Flo goes home to France in a month while she waits on permanent residency in Montreal.